Instow is a pleasant small town with a harbour, on the banks of the River Torridge in North Devon. Beyond the harbour wall is a large sandy beach which stretches some distance north. There is easy access to the beach. Signs warn that bathing is potentially dangerous due to strong tidal currents, soft sand and boats anchored close to the shore. See Beach Safety Guide. Various access points along the beach, mostly level and also a slipway. Dogs not allowed between the Quay and Lane End Road between May 1 and September 30. Dogs are allowed on the rest of the beach all year round. 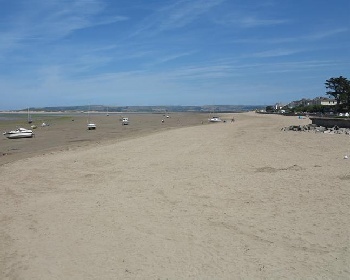 Instow is about 2 miles north of Bideford which is 25 miles from Bude and 48 miles from Exeter. There are various routes into North Devon. From North Cornwall take the A39 past Bude and into North Devon past Bideford and across the River Torridge, then turn left for Instow onto the B3233 (signposted to Instow). From Exeter take the A377 and approaching Barnstaple turn left at the Bishops Tawton roundabout onto the A361 and at the next roundabout go straight across onto the A39 for Bideford. Continue on the A39 east and just before the River Torridge turn right for Instow onto the B3233 (again signposted to Instow). On the B3233, turn right at the first roundabout and follow this road to Instow. 1 small car park in the town, 1 larger car park behind the dunes, also some road parking by the beach front. Yes by the beach front and also in the town.